Spectre - Blinded By Sin "While Spectre is active, all character dice except Spectre must not attach each turn"
We take this as any character LEGAL to attack the time. This wouldn't override something like say a captured dice can now attack? "Can't" overrides "must" in all instances. Captured dice can't attack, so no amount of Spectres saying they must will allow them to. Captured dice dont exist. So they cant attack. 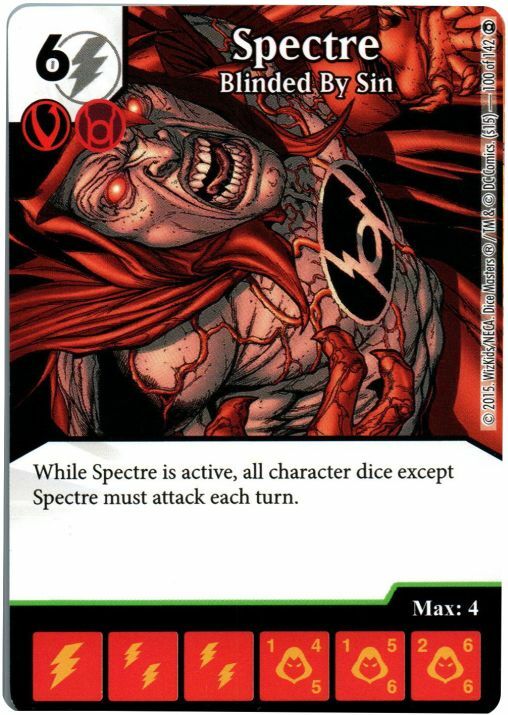 While Spectre is active, all character dice except Spectre must attack each turn. Otherwise, the statement is correct, each character that can attack, MUST attack. A Pepper Potts whom specifically says that she cannot attack, would be exempt. Unless she has had her card text wiped via Loki, then she would have to attack as well, as she no longer has any card text, and thus limitations on attacking. Prismatic Spray wouldn't be an issue since non-continuous action dice can only be played on your turn. Spectre affect only to the player who owns in field or each player in his Attack Phase? Looks like any dice that aren't spectre have to attack. It says all meaning everyone's dice. Yes, during each player's turn, all non-Spectre dice must attack.